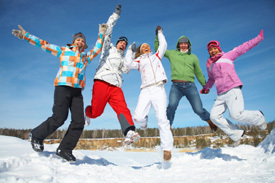 Playing sport and/or exercising in cold weather places extra demands on your body. A drop in your core body temperature of just 1°C causes your muscles to shiver, which can lead to low blood sugar levels and reduced sporting performance. It can also mean injuries. Sprains and strains are common winter – related injuries as cold muscles, joints and tendons are more prone to injuries. To reduce your risk of sprains and strains this winter, we recommend you thoroughly warm up, stretch and cool down. Warm up and stretch the specific muscle groups required for your sport/exercise and ensure you cool down once finished, as this is an important injury prevention strategy. See one of our physiotherapists to help you devise warm up, stretching and cool down routines appropriate to your sport/exercise and AVOID sprains and strains this winter. For further information on how to prevent and treat sprains and strains this winter, consult one of our physiotherapists.